This post stands beside Route 611 in Plumsteadville. 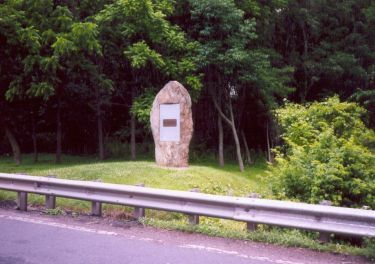 The inscription reads, "Edward Marshall Walker of Pa. Sept 20 1737 Gov Wm Penn" This marks the spot where Jennings stopped walking. Edward Marshall was born in Philadelphia County, in the Bustleton area. He was the middle child of five children. His brothers were William, Moses, and John. His sister was named Rebecca. Edward was strong and athletic. He was a very good hunter. He got a job working for Benjamin Eastburn, the surveyor general of the province. Edward went with the team of surveyors that charted the area. He carried the chain used for measuring distance. When William Penn settled in Pennsylvania he insisted on buying all of his land from the Native Americans. He treated them with respect, and never cheated them. Sometimes when he bought land, it was recorded as starting at a certain tree or other landmark, and ending at another. At other times, the land would be measured by a day’s walk. This would mean that the walkers would walk at a normal pace, stopping to eat and hunt. After William Penn left North America, his sons Thomas and John took over as Proprietors. They were not as honest as their father. They wanted to make some money. They sold land that they had never bought from the Native Americans. The brothers were afraid that the Lenni Lenape (Delaware) Indians would find out what they had done, so they decided to get the rights to a large piece of land. The land that the Penn brothers wanted belonged to the Minsi (Wolf) clan of the Lenni Lenape (Delaware) Indians. It was excellent hunting ground. The Minsi did not want to give this land up. Thomas Penn met with a group of Lenni Lenape chiefs in 1734. He showed them a deed. He told them that his father, William Penn, had signed a deed that allowed for as much land as could be walked in one and one half days. He claimed that this land had never been give to William Penn. The chiefs were confused, because they did not remember this deed. They said that they would go and ask the elders of their tribe what they knew about the treaty. Edward Marshall and Elizabeth Oberfield married in 1735. Edward and his brothers wanted to settle on some land above the Tohickon Creek. In 1733 they applied for a warrant to live on the land. The Deputy Surveyor-General recorded their claims to the land in May 1737. The land that they were getting was part of the land that did not really belong to the Penn brothers. Thomas Penn decided to have a trial walk, to see how far a man could possibly walk in a day and a half. He looked for men who were strong and good walkers. Three men were chosen. One of them was Edward Marshall. He was 22 years old. Timothy Smith was the sheriff of Bucks County. He was in charge of organizing the walk. He and John Chapman, another settler, met with the three men outside of the Friends Meeting House in Wrightstown. The three men chosen to walk were Edward Marshall, James Yates (or Yeates), and Joseph Doane. Edward Marshall was a good choice because he was so athletic. James Yates was a farmer from the area of Newtown. He was good at all kinds of sports, and was the best jumper in the county. Joseph Doane was from Philadelphia. He was not an athlete. He had been chosen to walk as an observer and representative of Thomas and John Penn. His job was to report back to the Penns at the end of the trial walk. The three men set off along the Durham Road, walking briskly. As Edward Marshall walked, he tossed a hatchet from one hand to the other. This balanced his walking, and the hatchet would come in useful for cutting away brush that was in his way. Chapman and Smith followed the walkers on horseback. Before an hour had passed, Joseph Doane was exhausted. He rode the rest of the way behind John Chapman on his horse. The other two men continued to walk all day, with a few brief stops. Sometimes Sheriff Smith would carve a letter “P” into the side of a tree to mark their route. By the end of the day they had walked almost 48 miles. They camped overnight near Northampton and returned to Bucks County the next day, walking more slowly and stopping to hunt. Thomas Penn and James Logan, who was the Acting Governor, arranged for another meeting with the Lenni Lenape chiefs. They were invited to come to James Logan’s home, called Stenton, on August 25, 1737. The Native Americans stated that they had no knowledge of the treaty, and Chief Nutimus asked for more time to discuss it. Thomas Penn allowed them the time until lunch was finished to make their decision. At last the Native Americans said that they had no further objections, and would allow the land to be paced out. They expected the walking to be done at a leisurely pace, with stops to eat and hunt, as William Penn had done. However, the treaty that they signed said that the land should be “walked, traveled, or gone over.” It said nothing about speed. The walk to measure the land was set for September 19, 1737. The three walkers were to be Edward Marshall, James Yates, and Solomon Jennings, who lived near Bethlehem. Sheriff Timothy Smith, Benjamin Eastburn, and several other men would accompany them. Three Lenni Lenape would also go along. The length of a day would be measured as 6 a.m. to 6 p.m. The timekeeper was Sheriff Smith. Each walker was to receive 5 pounds (an amount of money) in cash for making the walk. The man who walked the farthest was promised 500 acres of ground in the new land. The walkers started from a chestnut tree at exactly 6 a.m. From the start the walkers walked quickly. The Native Americans immediately complained that the walkers were running, but no one paid any attention to them. Edward Marshall carried his hatchet again, and the three men set such a good pace that they had traveled almost 8 miles in the first two hours. When they reached Gardenville, James Yates was well ahead of the other men. Edward Marshall walked steadily in second place, and Solomon Jennings was at the end, puffing and limping. The Native Americans were still complaining about the fast pace. Benjamin Eastburn and John Chapman took them up on the backs of their horses to ride the rest of the journey. After four more hours, the walkers had reached the present-day intersection of Durham Road (Route 413) and Easton Road (Route 611.) At this point Solomon Jennings collapsed. Sheriff Smith left him food and drink, and told him to catch up when he was rested. Jennings never did catch up, and went home slowly by himself. Marshall and Yates walked 28 miles before they rested. They then were allowed 15 minutes to eat and rest. The walk continued, with Yates in the lead once again. At one point, Edward Marshall seemed to be failing, but he scooped up some water from a mountain stream, and went on walking. The men stopped walking at exactly 6:15 p.m. (adding the 15 minutes for lunch.) They had walked about 27 miles. Edward Marshall threw his arms around a young tree, because he was exhausted. That night the men ate bacon, corn meal, and biscuits. Sheriff Smith posted a guard. The Native American observers had left the group earlier in the day and gone to report to the nearby village of Hockendaukua, where the chiefs Lappawinzo and Tishcohan lived. Smith was afraid that the Native Americans might attack them in the night, but no one disturbed them. Edward Marshall and James Yates slept deeply. The second day’s walk was supposed to start at 6 a.m. It was cold and rainy. During the night the horses had wandered away, and it took two hours to round them up. The walk started again about 8 a.m. Three Native American observers came from the village, but only walked a short way. They were so disgusted that they went back to their village. Marshall and Yates walked steadily until they reached the Tobyhanna Creek. Edward Marshall crossed the creek, whose swirling water came to his waist. Behind him he heard a cry from James Yates. Yates had fallen facedown in the water. Marshall was afraid that Yates would drown. He went back into the river, pulled Yates’s head above water, and dragged him to the far shore of the creek. Yates seemed to have hurt his leg. He rubbed his eyes and called out that he could not see. Just then the men on horseback came to the edge of the river. Edward Marshall called out to the men and asked them to help Yates. Then he turned and kept on walking. Now Edward Marshall was the only walker. He walked more slowly, and breathed heavily in the cold air. At 2 p.m. the Sheriff called “Time!” Marshall stopped, and threw his hatchet another fifty yards. The walk was over. Edward Marshall rested on the ground while the surveyors marked five trees with the date, and the names of Thomas and John Penn. The surveyors hired by the Penn brothers measured the area of land that had been bought by the Walking Purchase. Since the walk had gone toward the west, a line had to be drawn between the end of the walk and the Delaware River. It would have been fair to draw a line due east until it met the river. The surveyor did not do that. He drew the line at a right angle to the river. This gave the Penns much more land. This land was the best land for hunting. The Minsi did not want to give this land up. When they learned that this land was being taken from them, they felt they had been cheated. After the walk Edward Marshall returned home to his wife and children. They lived in a farmhouse in Tinicum Township. He waited for his award of 500 acres of land. It did not come. In August 1741 he went to see Thomas Penn at Pennsbury. He asked for his reward. Thomas Penn treated him poorly. He refused to give him any land. He offered to give him an extra 5 pounds (money) for making the walk. Edward Marshall left Pennsbury angry and unsatisfied. In 1752 the family moved to Mount Bethel Township, about 18 miles from Easton. Edward farmed the land, and still worked for Mr. Eastburn the surveyor. In 1755 the Native Americans attacked some settlers near Easton. There were several attacks in the area. In 1756 Edward Marshall’s farm was attacked. He was not at home. He and Matthew Hughes, a friend who lived with the family, were cutting logs about three miles from the farm. When the Native Americans attacked, five children were in the yard. They ran and hid in the bushes. One daughter, Catherine, was 14 years old. She was shot in the shoulder as she ran away. She ran to the river and hid. She used mud to stop the bleeding in her shoulder. Edward Marshall’s wife, Elizabeth, was in the house. The Native Americans took her away with them. They later killed her and left her body behind. In 1757 Edward Marshall’s farm was attacked again. This time Edward was away working at his surveyor’s job. His son Peter was working in a field. He was alone. He was shot and killed. Many farms and settlements were attacked. Benjamin Franklin was sent to defend the area. He and his men built Fort Allen. They left a small number of men to defend it, and went back to Philadelphia. In 1758 Edward Marshall married again. He married Elizabeth Weiser who was 30 years old. Native Americans had also killed Elizabeth’s father. Edward Marshall was angry at the deaths of his family members. He vowed to shoot any Indian that he saw. It is said that he killed over 20 Native Americans. Edward and Elizabeth had two sons. Their names were Frederick and William. There were eight children from his first marriage. All of them lived together. After some years they moved back to the farmhouse in Tinicum Township. It is said that Edward was a good neighbor. When he went hunting, he would sometimes kill an extra deer, hang it in a tree, and tell some of his needy neighbors where to find the venison. Edward did not feel safe. He was afraid that the Native Americans would attack his family in revenge for his part in the Walking Purchase. Edward had a brother named William. William owned an island of 128 acres called Tinicum Island. When William died in 1757, he left the island and all the buildings on it to Edward. Edward moved his family to the island. He built a strong log house for his family. After a while people began calling the island Marshall’s Island. Edward Marshall was on the side of the settlers during the Revolutionary War. His sons enlisted in the militia. It is said that he and his sons helped collect the boats for George Washington to use when crossing the Delaware in December 1776. We do not know if this is true. It is true that on November 30, 1777 he took an oath of Allegiance to the new country. Edward’s daughter Catherine had healed of her wound. She grew up and married a man named William Ridge. They had 12 children. Edward’s son Martin had a home near the Tinicum creek. Edward Marshall stayed in his home on Marshall’s Island. He was in good health. When he was 79 years old he became sick with a bronchial infection. He died on November 7, 1789. He was buried in a family graveyard near his son Martin’s house. There are several stones marking the route of the Walking Purchase. Edward Marshall’s name is carved on them. There are also historical markers that tell the story. Marshall’s Island is now called Eagle Island. It belongs to the Philadelphia Council of the Boy Scouts of America.